La Provincia de Isla de Pascua se ubica en el sector insular de la V Región de Valparaíso, tiene una superficie de 163,6 km² y posee una población de 3.791 habitantes. Su capital es Hanga Roa. Aparte de Isla de Pascua, la provincia incluye la pequeña y deshabitada isla Salas y Gómez, ubicada cientos de kilómetros más al este. Easter Island, known in the native language as Rapa Nui or Isla de Pascua in Spanish, is an island in the south Pacific Ocean belonging to ► Chile. 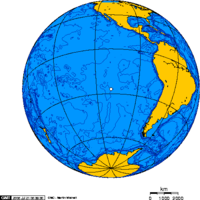 Located 3,600 km (2,237 statute miles) west of continental Chile and 2,075 km (1,290 statute miles) east of ► Pitcairn Island, it is one of the most isolated inhabited islands in the world. It was given its common name of "Easter" because it was discovered by the Dutch on Easter Sunday, 1722. It is located at 27°09′S 109°27′W, with a latitude close to that of the Chilean city of Caldera, north of Santiago. More images Easter Island - Easter Island (Category).